A couple of years ago I picked up this variegated Chilean myrtle tree in a gallon pot at Robinwood Nursery here on Vashon Island. Robinwood, a wholesale nursery founded in 1991, has recently opened their nursery to the public a few times a year. L. apiculata is a native of Chile and naturally I include it in my “Zonal Denial” category. I’m growing it in a pot and I’ve over wintered it in my “cold” greenhouse, which has supplemental heat only on the coldest winter days, keeping minimum temperatures above 38° F.
It has responded by blooming heavily for the first time since I purchased it . 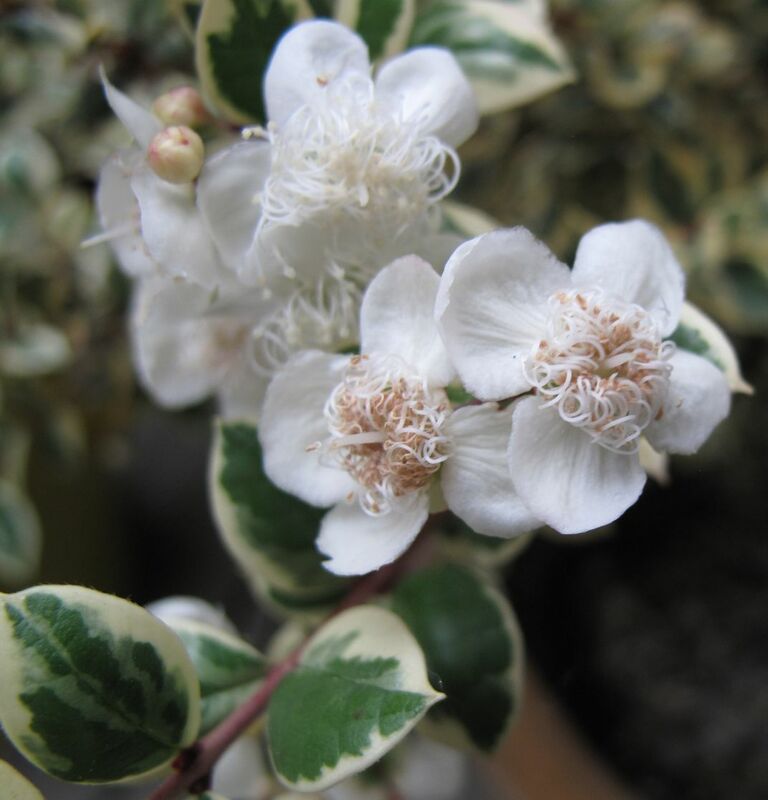 The small white blooms invite close inspection, especially against the backdrop of the variegated foliage. These flowers are about three-fourths of an inch wide, consist of four cupped-shaped, white petals, surrounded by a puff of numerous filigree like stamens. I’m looking forward to adding a photo of the small berries, which appear in the fall and are a deep purple-black. 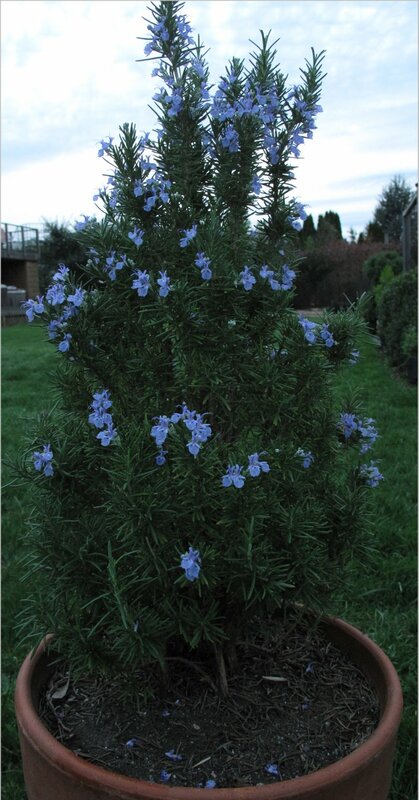 Unusual, evergreen aromatic shrub which has dark green leaves with attractive golden edges and clusters of pretty white flowers summer. Luma apiculata ‘Glanleam Gold’ is a handsome yet slow growing shrub, the original plant at Glanleam, on the west coast of Ireland, is only 2 – 3 meters tall after many years growth. Luma apiculata ‘Glanleam Gold’ is best planted in a warm position in sun or light shade, with plenty of shelter from cold winter winds. Unless you have a very warm garden, Luma apiculata ‘Glanleam Gold’ usually grows best in southern areas of the U.K., in particularly Devon and Cornwall. For almost everything else you need to know about Chilean myrtle, check out this post by Seattle tree maven, plant expert and writer Arthur Lee Jacobson (be sure to scroll down for the pictures). This month just might prove to be the warmest February on record for the Seattle area. And wetter too! By February tenth we had already exceeded the average precipitation for the month (3.75″ vs 3.50″ average). It’s 3 PM as I write and about 60° F. in my yard (time to mow the lawn); the temps in the city of Seattle are above 65° F., which to my mind is downright feverish. I haven’t really paid close attention to the weather statistics until today, but some my plants have definitely been showing evidence they are ahead of schedule. 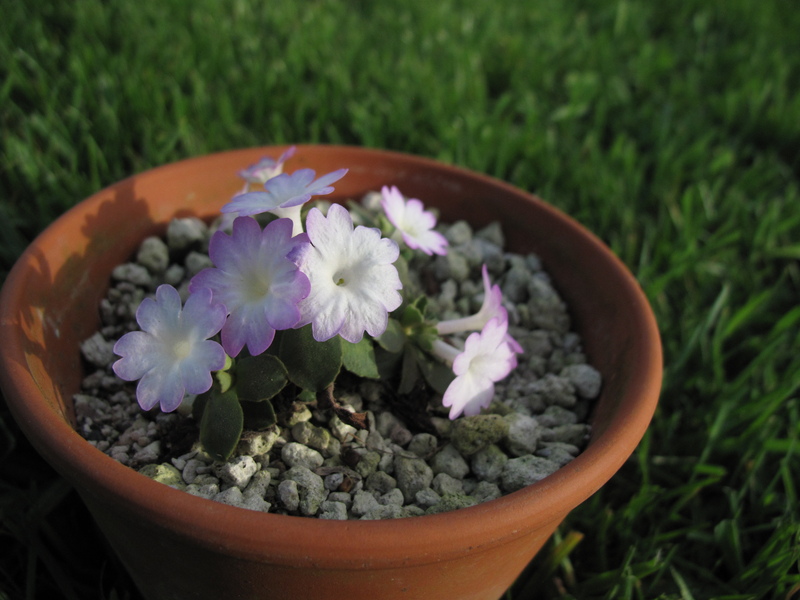 This little alpine primula cross was outside all winter under a bench, but still able to get a bit of moisture. Two years ago it didn’t bloom heavily until mid-March. 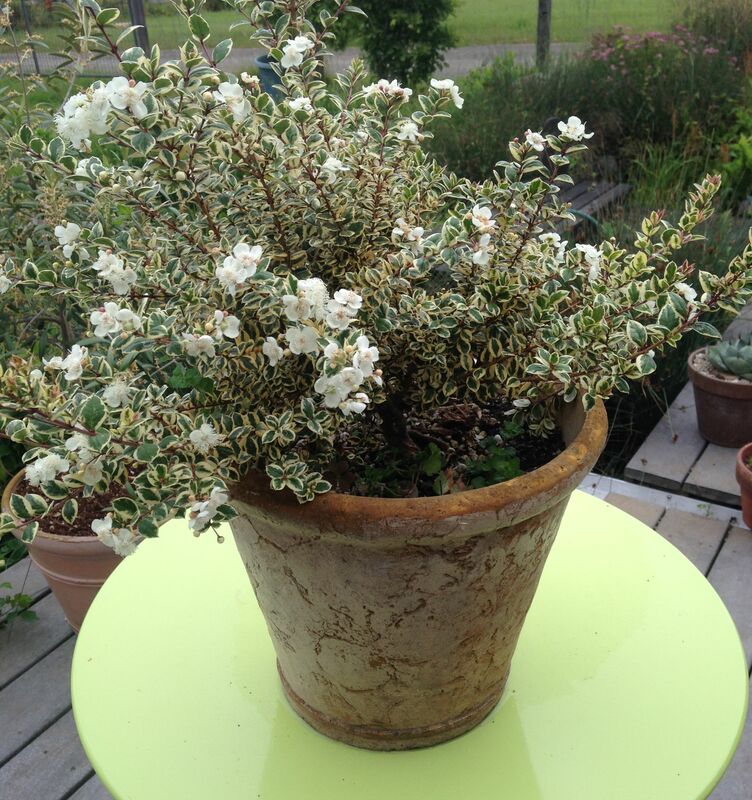 A rosemary plant in a clay pot had the benefit of my greenhouse and is very happily blooming at the same time as the Hellebores. 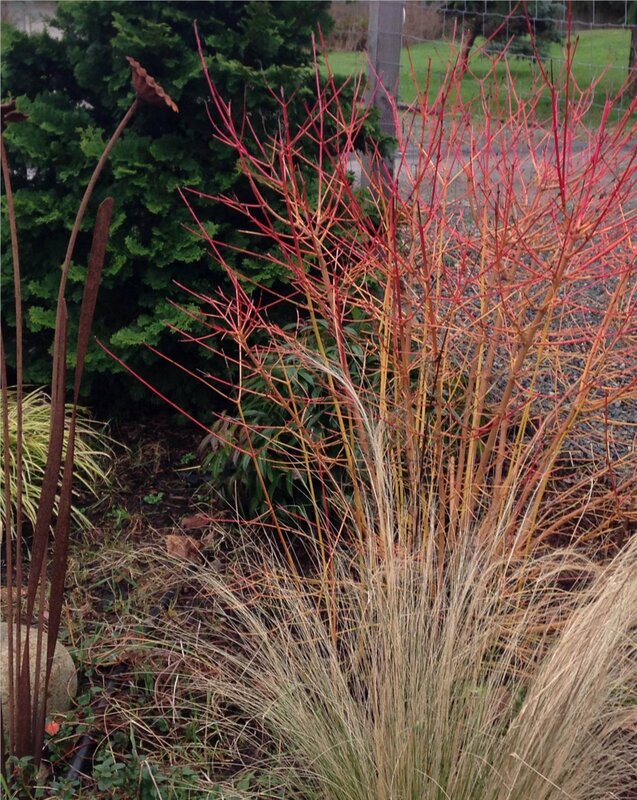 The dwarf red twig dogwood (below) is showing some nice red stems, which I believe is what it’s expected to do over the winter; perhaps it will leaf out earlier this year. The Mexican feather grass in the foreground doesn’t look bad, but probably should be trimmed back to get ready for the real spring. 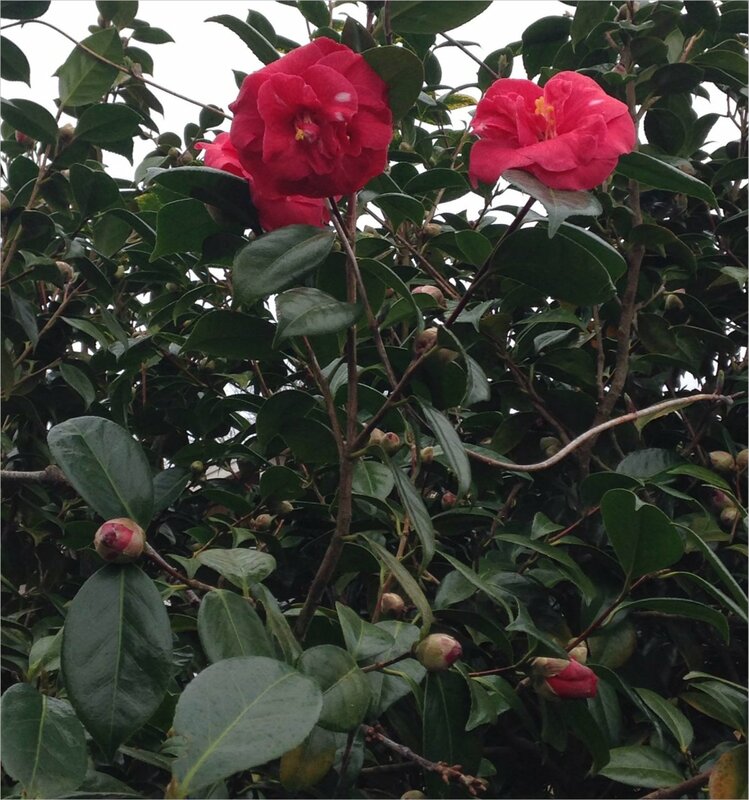 I’m not sure if the Camellia japonica in my garden is that early, since these two blooms are just out while the rest of the plant is still in buds. This mature plant, about seven feet high is usually quite early, but right now it’s blooming at the same time as C. sasanqua, the winter blooming Camellia. What’s blooming in your February garden? 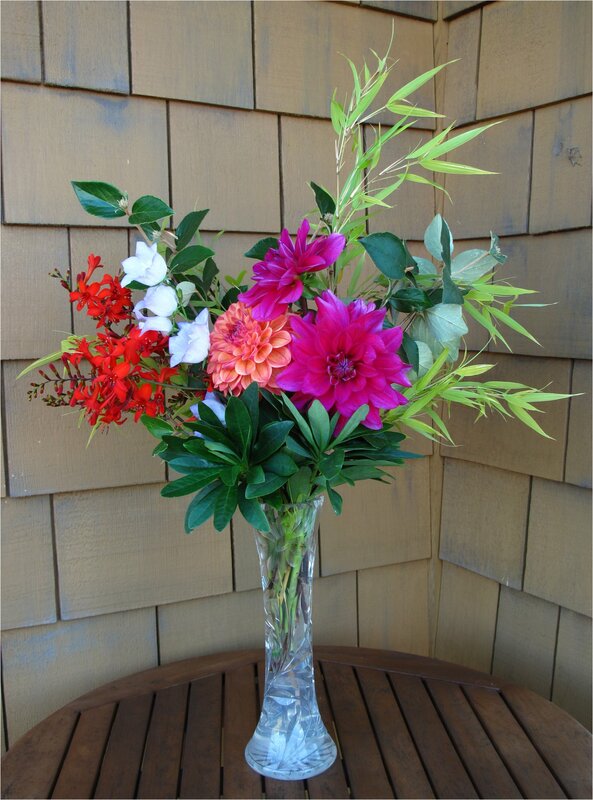 I’ve been thinking of renaming my blog The Avant Gardner: Reflections from a Vashon Island Garden. When I first thought of the name, I guessed other bloggers were probably already using it and never followed up. I also figured my garden was hardly avant garde, and neither were my gardening techniques. What follows that intro is apparently Courtney’s experience with anaphylactic shock in the garden. The Australian singer’s new album, “A Sea of Split Peas,” features the song, named, you guessed it, Avant Gardener. knew of another place in space in time. said if you please I beg your pardon. By then, thanks to my sleep deprived state, my “Zonal Denial” plants were morphing into “Tonal Denial” plants. I decided it was time to fall asleep.